Beforehand, we talked a bit about which instruments were used and if we need some arranging for amps or drums. We ended up using my drums for Onno, tuned to his preferred sound. The bassdrum is mic’d with a sennheiser e602, toms with the md421’s, snare with a sm57 and overheads are Neumann KM184’s and the BPM CR76. For John’s sax I initially planned for a Sennheiser MD441, but since John moves a lot during his performance, the MD441’s supercardoid pattern wasn’t the best solution to capture his performance. The wide Cardoid pattern of the new Rode NT1 did the job perfectly. Just to be sure John didn’t move too much from the mic ( and also cameras) I marked out a cross on the floor with tape for John to help him stay in the same place as good as possible. 2 room mics are placed at the walls to capture as much of the room as possible. MD21’s are used for this, once again. Onno Govaerts’ Drums: Bassdrum eq boost at 80 hz, Snare eq boost at 150 and 6khz, dip at 369. Elysia mpressor compression to bring out the softer notes. Toms both have compression to, again, bring out the softer notes. Slight eq boost at 5k to emphisize the attack. Overheads have a highpass filter and large eq dip at 289 beause of a prominent guitar frequency. Slight eq boost at 9k for air and stick articulation. A multiband compressor set from 5 to 7 k reduces the harshness in the cymbals while retaining the attack. A sidechain compressor is set to duck at snare attack, to have a bit more from the close mic instead of the overheads for snare. John Dikeman’s Sax: The sax has hi- and lowpass filtering to remove unwanted frequencies by the rest of the band. An instance of Waves Vocal Rider is used to help to tame the largest differences in volume. A multiband compressor is used to tame some recurring loud frequencies in the uppermid range. A fabfilter pro-g is used to clean up the signal a bit. The signalchain is rounded of with some compression to help the sax sit in the mix, before going through some slight reverb for ambience. Dirk Serries’ guitars: I make sure the lowend is mono by applying the TP Basslane lowend monomaker by Tone Projects. General eq is boosting the highend and low end (smiley curve). Some frequencies who are too prominent are dipped and the entire guitar is passed through tape for extra harmonics and finally boosted the side signal to make the guitar wider. First I passed the entire mix through tape, but that didn’t work out that well. The sound the guitar got, though, was very pleasing so I ended up only using tape on guitar. The connection with American sax player extraordinair came after inviting John as guestmusician to THE VOID OF EXPANSION (Tomas Järmyr & Dirk Serries) show at Kunstencentrum De Compagnie in Veghel (The Netherlands) early 2014. 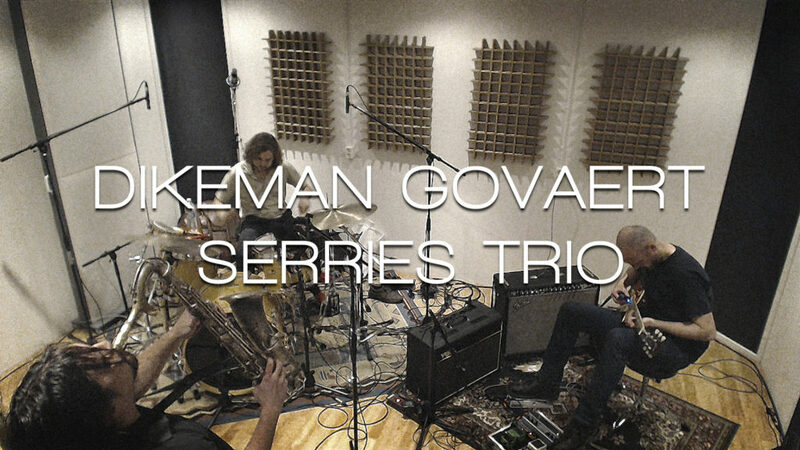 Now John Dikeman, Dirk Serries and Dutch wonderdrummer Onno Govaert are forming a new trio, continuing to seek the balance between minimalisme, repetition, noise and freejazz. Since improvisation originates, grows and matures over time in live settings, the DIKEMAN/GOVAERT/SERRIES trio is now available for concerts. John Dikeman (CACTUS TRUCK, UNIVERSAL INDIANS) is an American saxophonist currently residing in Amsterdam. Drawing inspiration from a wide range of sources, John’s playing runs the gamut of improvised music and technique, ranging from reductionist extended technique based improvisation to full throttle free jazz. The underlying characteristic of his music is an unnerving commitment, a total abandonment to sound. John has performed extensively in the USA as well as Canada, Lebanon, Egypt, Algeria, Libya, Sudan, Israel, France, Germany, Belgium, Poland and the Netherlands where he is an active performer and organizer. Since moving to Amsterdam John has performed with Joe McPhee, Han Bennink, Andy Moor, Terrie Ex, Roy Campbell, Hilliard Greene, Mike Reed, Jeb Bishop, Ab Baars, Nate McBride, Fred Lonberg-Holm, Michael Vatcher, Jason Roebke, Wilbert De Joode, Dirk Bruinsma, Jasper Stadhouders, Onno Govaert, Andrea Taeggi, Frank Rosaly, Klaus Kugel, Yedo Gibson, Renato Ferreira, Raoul van der Weide, Eric Boeren, Viljam Nybacka, Wim Jenssen, Oscar Jan Hoogland, Ivo Bol, Alfredo Genovesi, Meinrad Kneer, Gerri Jager, Stevko Busch, and numerous other musicians from the Dutch and international improvisation scene. Bloody Valentine, Jesu and others.